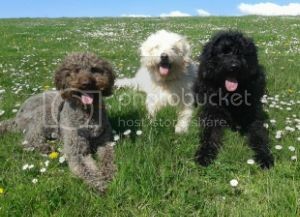 UK Labradoodle Association • View topic - quivering bottom jaw?? Oscar..
Post subject: quivering bottom jaw?? Oscar..
For three days now Oscar's bottom jaw has been quivering/spasming for a short time every now and again. He was at the vets yesterday, they had a quick look in his mouth and said they couldn't see anything obvious and told us to monitor him for 4/5 days. If it persists, the poor boy may need to be sedated for a proper investigation. How does a dog usually tell you if he has a sore mouth? Has anyone ever come across a dog with a quivering jaw? Post subject: Re: quivering bottom jaw?? Oscar.. I would try massage head and jaw and gently the neck. Has he landed in odd way at agility or real rough tug games? Good point Bid. I'd dismissed it in my head already. I know a few dogs that do it, often looks like their teeth are chattering. One particularly when food is in the offing, can't help but laugh at it does look amusing. Hope Oscar's is something as innocent. Just a quick update, Oscar's jaw issue seems to have settled/reduced a little now, He now only seems to do it directly after a big yawn , so we are maybe thinking that he has been nursing some kind of injury or strain - possibly brought on by too much barking at postmen . Here's hoping for a quiet Vet free Christmas.